So far Joe Alvaro has created 5 blog entries. The newest Lodgix feature allows users to convert an iCal block to a reservation with just a single click. The new reservation can be updated or modified just like any other. This feature is only available for blocks created via iCal. It will not work for blocks that have been created by subscribers, employees, or owners. Most iCal feeds will not include the guests email address, and thus it cannot be used when creating the reservation. In these circumstances, Lodgix will generate a system email. This can be manually updated with the guests actual email address. If any additional information is passed through the feed (comments, etc.) it will be captured and stored in the Invoice Comments area of the guest control panel. Lodgix subscribers now have the option of offering a guest the ability to “Instant Book” on all Lodgix properties participating in the HomeAway integration. Guests prefer a property that’s instantly bookable, and properties that offer Instant Booking typically enjoy higher conversion numbers. On HomeAway, higher conversions = higher sort order = more bookings. Previously HomeAway only offered the option to Book it Now, which allowed the property manager 24 hours to approve or reject the booking. Instant Booking is really not that different, except that Lodgix will immediately communicate to HomeAway that the booking has been confirmed without any action on behalf of the property manager. Within Lodgix, there is really no difference between the two options as all the processes typically required to confirm an invoice (reservation deposit payment, signed rental agreement, etc..) would still have to be completed after the booking has been confirmed. Instant Bookings can still be cancelled, however HomeAway requires that Instant Booking participants understand that too many cancellations of Instant Booking reservations will negatively impact that property’s sort order on HomeAway. 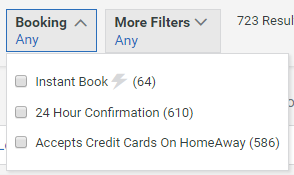 Instant bookings are a filterable item on HomeAway. So the combination of a separate filter for Instant Book listings and the fact that Instant Book listings have higher conversions, is a pretty compelling reason to enable it for all of your listings. The end result will be even more bookings from HomeAway as your property sort order will continue to improve versus other listings that aren’t offering Instant Book. 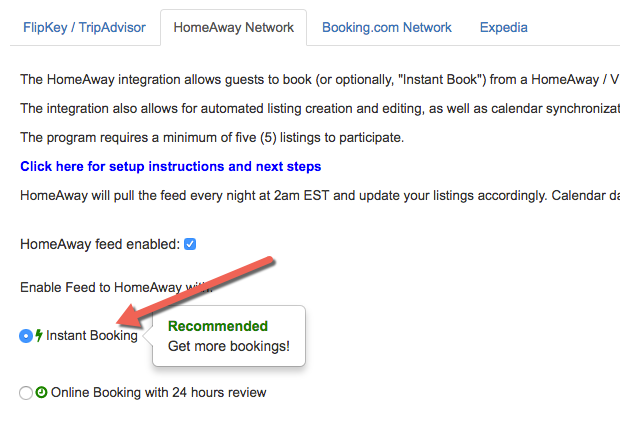 Participation in the HomeAway Instant Book program does require approval from your HomeAway account manager. They will review our account to determine if your booking conversions are high enough to warrant participation in the program. Example code and an illustration of the CSS Book Now button is located at the end of this entry. The guest will receive an email containing a “Book Now” text link as seen above. The emails that guests receive will now contain a “Book Now” button instead of the default Book Now hyperlink.